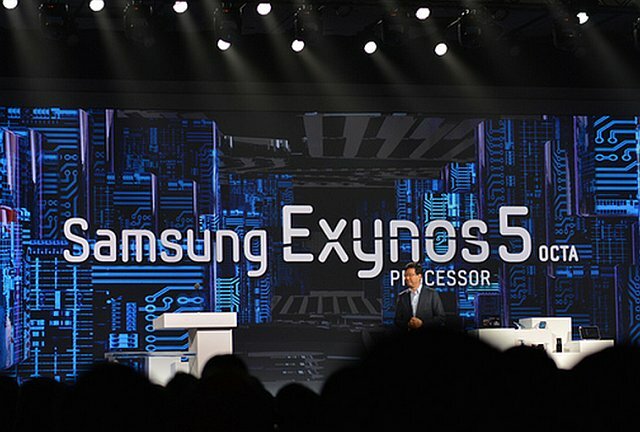 Samsung Announced Exynos 5 Octa, eight-core chipset at the CES 2013 event. The Exynos 5 Octa has eight cores and is based on big.LITTLE processor switching technology. The processor will have four ARM A15 cores and four ARM A7 cores(1.8GHz A15 for the hard work, 1.2GHz A7 for lighter tasks). The SoC is designed to dynamically split the workload between the high-performance and the high-efficiency CPU cores based on the task at hand. In all eight cores, four of them are high-performance Cortex-A15 cores. The other four are Cortex-A7 CPU cores, these have the same feature set and capabilities as the A15 cores, but optimized for power efficiency rather than performance. the application processor offers maximum performance and up to 70 percent higher energy efficiency compared to the previous quad-core Exynos. The A15 CPUs will kick in only when required for more intensive tasks like gaming and multimedia among others, can deliver more than twice the performance of Exynos 4 quad. SoC is developed on a 28-nanometer process. Samsung also announced a new 10.1-inch 2560×1600 pixel display(300ppi) that will consume 25 percent lesser power than the current displays of the same size and resolution. Samsung also revealed a flexible OLED display, which is practically unbreakable and a prototype smartphone employing the curved display. Samsung is calling it YOUM.